Apple’s iPhone 7 launch date has been confirmed to hold in its next big event. Apple has sent out invites to selected media to join them in San Francisco’s Bill Graham Civic Auditorium on Wednesday, September 7th. Its a common knowledge that the event will reveal the iPhone 7 and the iPhone 7 Plus smartphones ( and iPhone 7 Pro? ), and it is highly likely that a second-generation Apple Watch will also be revealed. In Dubai, pre-order for Apple’s yet-to-be-unveiled iPhone 7, Plus and Pro has gone “live”, though many still believe the Pro version may not be included. However, Apple is yet to even acknowledge the existence of iPhone 7 or iPhone 7 Plus, or the Pro version. Officially, iPhone 7 launch event will follow pre-orders for the iPhone 7 family of devices which are expected to open on Friday, September 9th, with sales to commence one week later on September 16th, and it is highly likely that a second-generation Apple Watch will also be revealed. To those who follow Apple’s product launch patterns, this year’s event will be different than any other iPhone unveiling. Apple typically works on a “tick-tock” cycle for iPhone releases, with the “tick” model introducing a fresh design and the “tock” adding incremental improvements the following year. This year was supposed to be a “tick” year. But according to numerous reports, leaked photos, and industry gossip, the upcoming iPhone is expected to look nearly identical to the iPhone 6S, but with a larger camera, no headphone jack, redesigned antenna lines which could be a major drawback. On the plus side, the new models are expected to be more water resistant, with the larger phone reported to have a dual camera system. With Samsung Galaxy Note 7 featuring 6GB RAM together with a 128GB onboard storage, Apple may finally do away with the 16GB entry model and move up to a 32GB model as well. Tim Cook’s job this September will be to sell the iPhone 7 as something that is new and exciting while hoping that the world’s press will not focus on the fact that much of the iPhone 7 technology is not quite different from iPhone 6S – Galaxy S7 specs outstripped it but Speed test proved otherwise. With the removal of the 3.5mm headphone jack, consumers will have to rely on Bluetooth-equipped headphones or headphones that have licensed the use of a lightning jack from Apple’s Made for iPhone program. I believe Apple, who has removed hardware from products before, manage to get customers to buy bulky adaptors or buy new headphones specifically for use with the iPhone. As for the Apple Watch, KGI Securities analyst Ming-Chi Kuo, who has an excellent track record predicting new Apple products, says the new model will look very similar to the current one, but will have improvements in battery life and new sensors like a barometer and GPS. Kuo said to expect the new Apple Watch this fall but wasn’t clear on whether it would be unveiled at the same time as the iPhone 7 or later in the year. Meanwhile, Apple is already laying down the groundwork to counter the argument that the new iPhone is the Emperor’s New iPhone, with no innovation inside a shell that will look remarkably like 2014′s iPhone 6. Steven Levy has been given a C-level briefing on the changes to Siri to promote Apple’s use of artificial intelligence, Rick Tetzeli was offered Angela Ahrendts for Fast Company’s profile on how Apple is changing its retail environment and Jena McGregor gets the philosophical interview with CEO Tim Cook for The Washington Post. Though, there’s one other major product in Apple’s pipeline: a redesigned MacBook Pro laptop. But Bloomberg’s Mark Gurman reports that the new MacBook Pro will be announced separately from the iPhone 7. 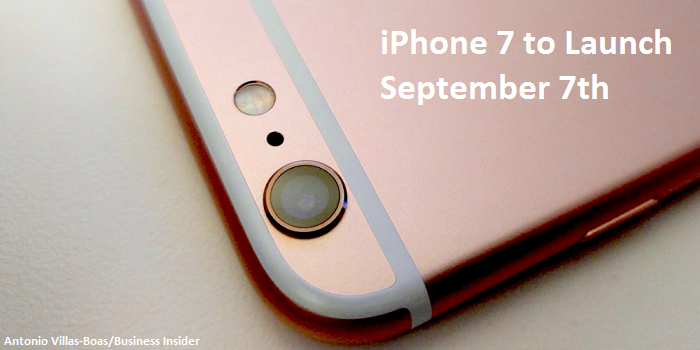 For now, all we have about Apple’s iPhone 7 launch, is a date and the rest is speculation all we know, We will keep our eyes open until September 7th.